If you’re a die-hard feline fancier, you’ve most likely been to a cat show. 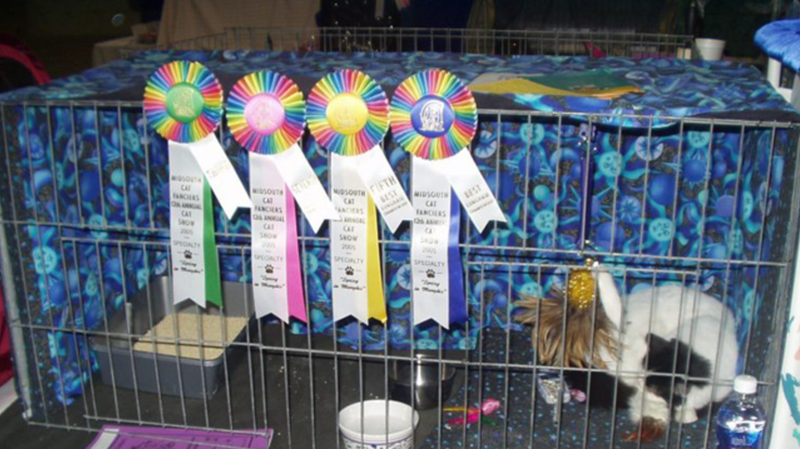 Between the elaborately decorated cages, the agility contests, and the perfectly groomed Persians, you may have a) left the premises needing Benadryl or a lint roller, or b) wondered how these juried competitions began. Turns out, ailurophiles have wanted to show their furry companions off to the world since long before the Internet popularized cat videos, or memes transformed felines like Lil Bub or Grumpy Cat into celebrities. Many sources say that the world’s very first cat show was held at the St. Giles Fair in Winchester, England in 1598, but beyond that, there's not much information about the event (if it actually took place). In subsequent years, more cat owners might have hosted similar, lesser-known affairs. But the event that truly put cat shows on the map was a national competition at London's Crystal Palace in July 1871. In any case, the grand Crystal Palace event reportedly showcased a range of exotic cats. According to varying reports, between 150 and 211 were shown. A staggering 200,000 guests are said to have ogled a range of Siamese cats, Manx cats, Persian cats, and English Shorthair cats. Newspapers noted the presence of other unusual felines, including a Scottish Wildcat owned by the Duke of Sutherland, an Algerian Cat that was listed as a “French African cat,” a polydactyl cat that had 26 claws, and a tortoiseshell cat. Some cats are also said to have belonged to the Palace's workmen, or to have been caught in the palace cellars and thrown into cages to satisfy the event's animal quota. The cat show ended up being such a public success that Weir organized another cat show at the Crystal Palace several months later. The first cat competition had been planned in a hurry, and showcased many fancy pets from aristocratic households. The second show, however, encouraged working-class individuals to submit their ordinary domestic cats. Weir hoped that by celebrating the humble Tom, owners would take better care of their feline companions. The follow-up exhibition ended up displaying far more kitties than the first one, and an expanded judge pool awarded trophies to pedigreed and "working men's cats" alike. Meanwhile, between the two Crystal Palace shows, a feline frenzy spread over the denizens of Europe. Four other private cat shows were held by entrepreneurial members of the lay public—two in London, and two in Scotland. Soon after, cat shows became a common occurrence in Europe. Eventually, the practice crossed the Pond. The first well-known cat show in America was held in New York City’s Madison Square Garden in 1895. Fanciers began organizing their own events, and various American cat clubs and associations were formed. Over the years, cat shows gradually morphed into the be-glittered, be-furred, and, well, slightly absurd animal pageants they are today. Of course, all countries rely on separate breed standards, and each cat group adheres to its own rules and regulations—meaning one cat show isn't necessarily like the other, depending on its location or organizer. Still, it's fun to know where the practice got its start—and to know that the Siamese, which is now the ninth most popular cat breed in America, was once seen by a journalist at the first Crystal Palace show and described as an "an unnatural, nightmare kind of cat." Times and tastes may change, but rest assured: As long as there are cats, there will always be cat people ... and cat shows.